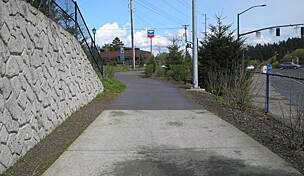 The Banks-Vernonia State Trail stretches through the hills (east of the Coast Mountains) between its two namesake towns. The former railroad corridor—once part of the Spokane, Portland & Seattle Railway—hauled timber from mills in Vernonia and Keasey to Portland beginning in the 1920s until 1957. For five years during the 1960s, the line was used for passenger excursions. 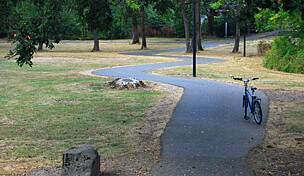 Oregon Parks and Recreation gained official ownership of the right-of-way in 1990. Thirteen bridges, as well as two 700-foot-long, 80-foot-high railroad trestles at Buxton and Horseshoe, offer amazing views. 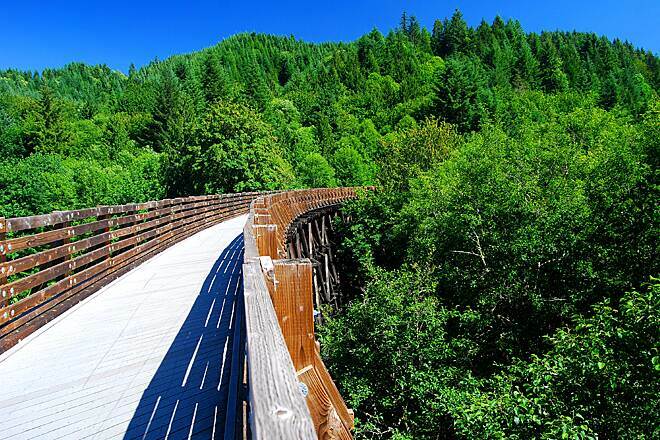 The gentle grade (in all but one area) provides beautiful scenes of the Coast Range from forested hills, as well as access to side trails displaying railroad relics and to a number of rivers and creeks. A variety of flora and fauna also populates the trail. Most of the route consists of an 8-foot-wide hiking and bicycling trail paralleled by a 4-foot-wide horse trail. 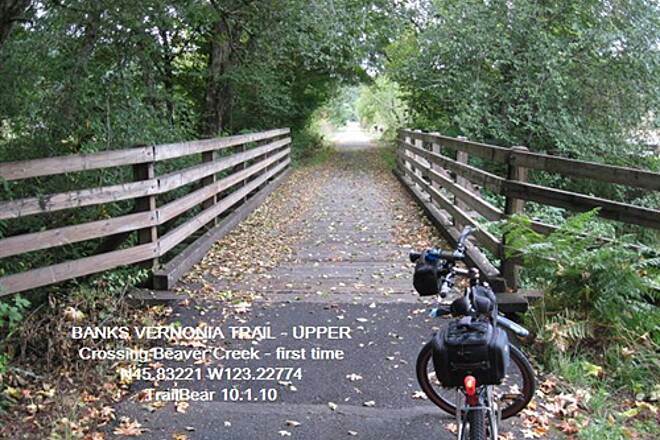 The trail rises from Banks to Vernonia on an average 2% to 5% grade. 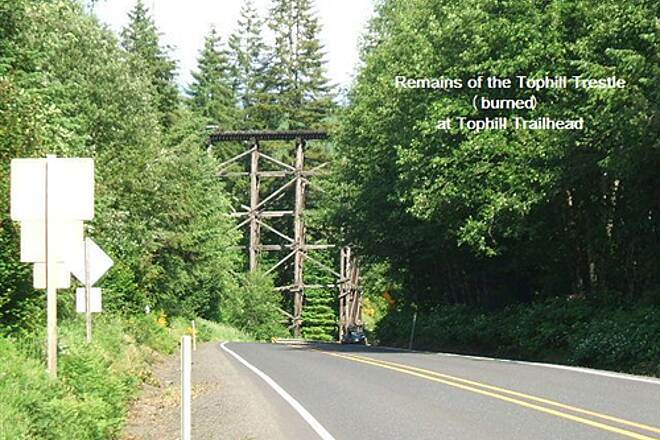 One exception is the Horseshoe Trestle bypass, which switchbacks up 700 feet and descends 300 feet at Tophill. Equestrians will find ADA-accessible loading platforms and hitching posts at several trailheads. Please use caution cycling on any speedy downhill shots. Yield to horses, and be visible or audible when approaching. 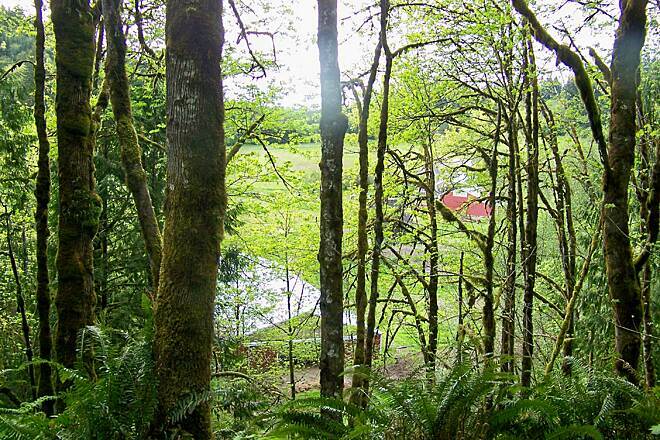 From Banks, enjoy a gentle 5-mile incline—good for families—through pastoral farmland. The grade steepens a bit on mostly wide and sweeping switchbacks as you approach the Buxton trailhead in a canopy of trees. 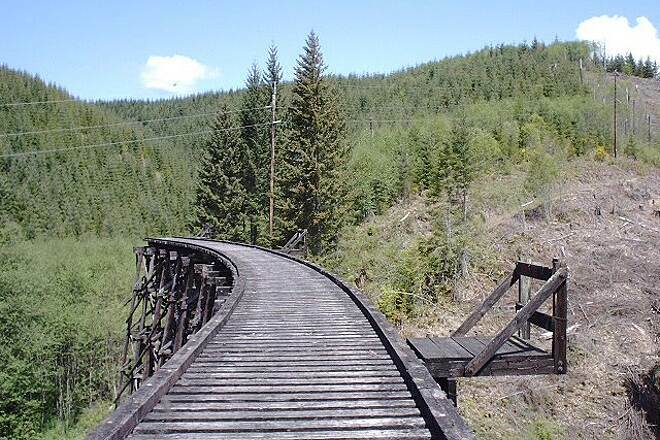 The Horseshoe Trestle was half-destroyed by fire, but bikers and hikers can cross the curving 700 feet of the restored Buxton Trestle at about mile 6. A ground-level equestrian bypass crosses Mendenhall Creek. The route continues to the Buxton trailhead, where you can picnic and wander interpretive trails. You'll then pass through L. L. Stub Stewart State Park, a 1,700-acre full-service state park and campground. Just before reaching the Tophill trailhead at mile 12, the route descends into short, steep switchbacks across Nehalem Highway, bypassing the Horseshoe Trestle, and then climbs back to the trailhead. After the Beaver Creek trailhead at mile 17, the path emerges from the woods and hugs the highway for a gentle descent into Vernonia. Prepare for a few bumpy spots and tight turns near Vernonia. The route goes through Anderson Park, just blocks from downtown Vernonia, and continues for a couple more miles to Mill Pond/Vernonia Lake. 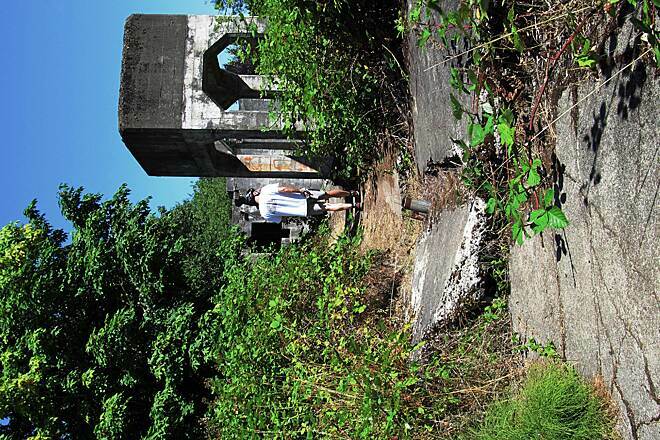 Vernonia offers shops, galleries, and a museum. 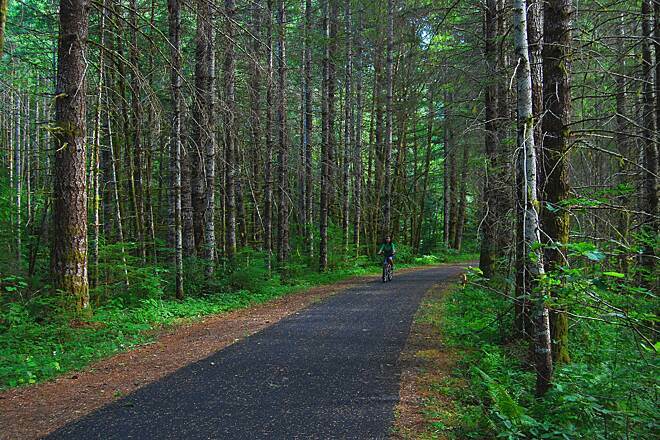 You can access the trail in Vernonia, Buxton, Manning, or Banks. 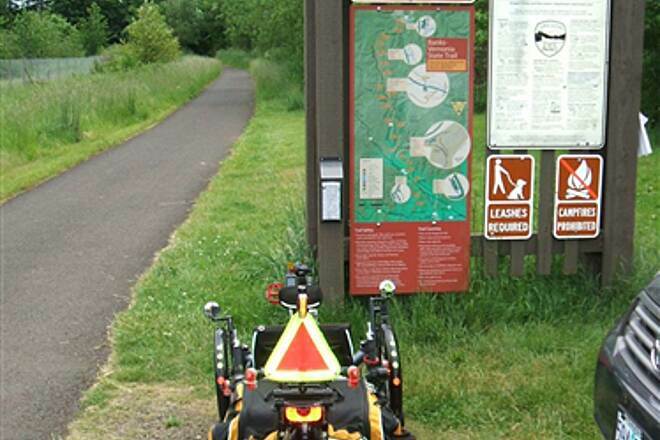 The route passes through L. L. Stub Stewart State Park; however, day-use parking is not easily accessible from here, aside from a loading zone at the trail crossing of the park road. 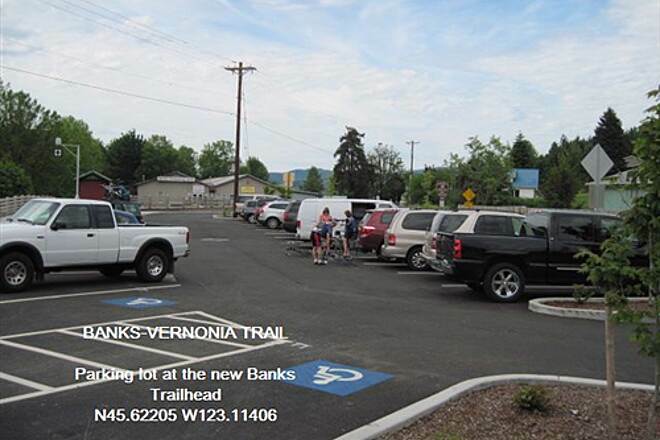 The Banks trailhead provides the best parking, as well as restrooms and drinking water. From Portland, drive west on US 26 for about 21 miles. Go about 0.5 mile past State Route 6 (NW Wilson River Highway), and turn left onto NW Banks Road. In 1.7 miles, look for the lot at the bottom of a steep hill near NW Sellers Road. 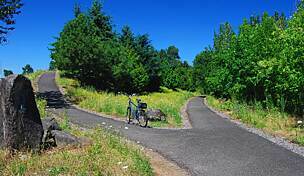 To reach the Vernonia trailhead, from Portland, drive west on US 26 about 28 miles. Make a slight right onto SR 47 N (Nehalem Highway), and go 14.4 miles, looking for signs for Vernonia/Clatskanie. Turn right onto Bridge Street. Go 0.2 mile, and turn right (the third right) onto Jefferson Avenue. The trailhead will be on the left after 0.2 mile. My wife and I rode this trail for the first time July 20 and 21, 2017 (a Thursday and Friday). 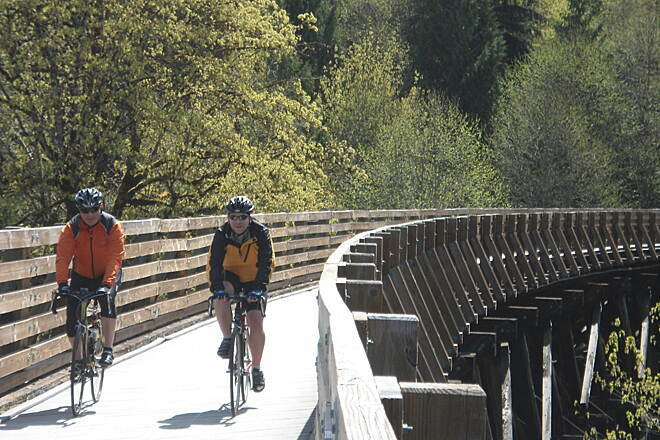 Our plan was to ride Banks to Vernonia, stay overnight in Vernonia, and return the next day. On Thursday we drove from the Olympic Peninsula in Washington to Banks, arriving around noon. We were shocked to find that the State allows no overnight parking in the trail head parking lot. Besides that, the parking lot which holds about 30 vehicles (about half for compact cars) was full and there was only one compact space left which we could not use b/c we drive a minivan. We discovered a bicycle shop "Banks Bicycle Shop" 503-596-2433 adjacent to the trail head where we received some suggestions of where we could park from the very helpful staff which solved our problem. We have heard that the shop will actually come out on the trail to provide assistance. We also visited the Sheriffs office where we were told by the office staff that they thought we could park on the street for 48 hours without a problem. Our bikes are hybrids and we ride with a handlebar bag, trunk bag, and for an overnight ride, panniers. We noticed most of the bikes on the trail were road bikes with no gear at all, so their experience may be different than ours. The trail is black top all the way and scenery abounds. Yes, the trail has a number of root bumps, but most are well marked with paint stripes. Also, the beginning and ending of the bridges have significant bumps, but you just have to be aware of this. The first 4 or 5 miles are flat, or perhaps a very slight grade. However, the next 7 miles is a steady, unrelenting 5% grade and by the time we got to about the 12 mile point, we were very disappointed. About that time we met another biker who told us we were nearly at the top and we would soon begin the descent. Just before arriving in Vernonia there was a slight upgrade, but nothing much. We arrived at our B&B, "The Carpenter's House" and spent a very comfortable night. The next day we looked forward to "payback time". We rode the gentle incline to "Hilltop" and then had a magnificent ride back to Banks. Had we known the extent of the upgrade on the first day, it would have been easier because we would have known it would not extend all the way to Vernonia, but most of the reviews speak only of switchbacks and steep incline, which are very short and insignificant for us in comparison to the unrelenting upgrade for 7 miles. The bottom line is, it is a beautiful trail and a beautiful area and the answer to the question of whether we would do it again is "Yes!" because we would now be forearmed with knowledge of the trail layout. I have used this trail extensively the past 5 years in preparation for Ironman 70.3. Great training course and easy transition area for bike to run. Having a place like this with ready access and no vehicle traffic is a wonderful resource for this area. Our time was limited so we rode from Vernonia to Stubbs-Stewart State Park and then back to Vernonia for a total of 23.3 miles. This trail is good for flat out hauling or a casual ride through the woods. There is about a 3% grade to the park so the ride coming back seemed much faster. The trail was clean from any liter and kept extremely nice. Beautiful ride through the trees. On a hot day this would keep you shaded and cooler. If you need "fuel" don't forget your energy bar or what ever. You can get nuts and bars at the Visitor Center at the park. There are restroom facilities along the way so no worries there. It was a most pleasant ride and we are looking forward to seeing the other half of the trail on another day this summer. After the ride we ate at the Black Iron Grill in Vernonia. Good food and a nice relaxing lawn to rest our weary bones! It's great for a weekend stroll with the family, very beautiful. For someone who is looking for a more serious ride I would say this is probably not the trail for you. 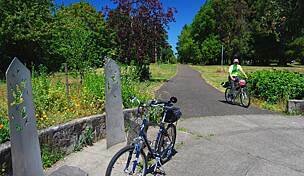 As lovely the Vernonia trail is, it's geared more towards families I feel. It has road crossings which i'm sure most do but its a very stop and go kind of ride. Lots of families, dogs, horses, other bicycles. Again, very stop and go. If you go during the week it may not be so bad but on the weekends its pretty crowded. Again its a very beautiful ride and great for the family. Biking (racing, road, mountain in LL Stub Stewart State Park, and touring, hiking, skating, board skating, riding horses, camping, cabins, fly fishing (Nehalem River). Good cafes and beer in Vernonia. Good cafes and beer in Banks). What else can you expect in a trail. mmm I forgot, rural, woods, birds, elk, deer (and more elusive, pumas and bobcats). 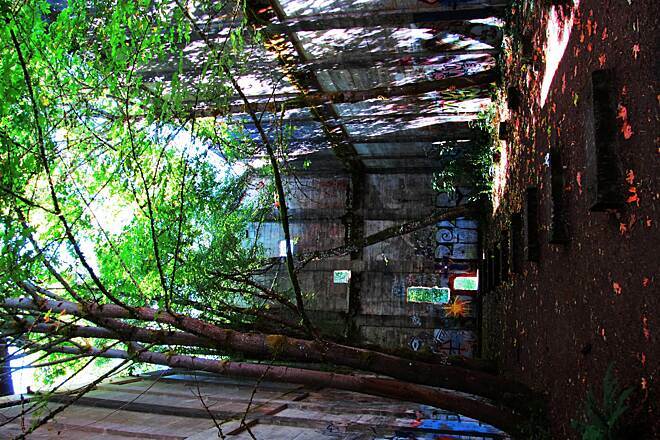 Try it, enjoy it and then go crazy in Portland (or first go crazy and then do the trail). I ride this trail regularly in the summer and fall. The trail is basically half climb and half descent. A gradual climb from Banks until your reach mid-point in Stubbs Park and then a nice long downslope to Vernonia. And vice versa if riding from Stubbs to Banks. It is easy to pick up speed descending the trail from Stubbs to either Banks or Vernonia (and is quite a bit of fun). However, there are two significant dangers: Dogs and Children. On the weekend, there are many families on the trail with kids behaving as kids - not really paying attention and leaving bikes parked in the middle of the trail. The second significant danger sent me to the urgent care last year. 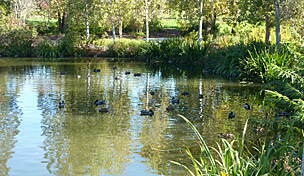 There are many farms from the Banks area until you reach the trestle and approach Stubbs Park. The farmers allow their dogs to run free in the area and the dogs are frequently on the trail. During my descent into Banks, I t-boned a large dog that came through the bushes on the side of the trail and ran immediately in front of me. Without any time to stop, I hit the dog and flew twenty feet. Would have been much worse without my helmet. Anyway, great trail, but be aware that you are in a farming area and not a controlled metro setting. 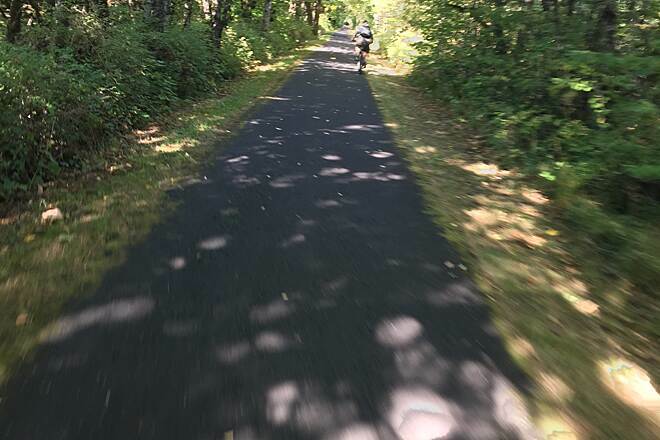 I've loved the Banks-Vernonia Trail since it was just paved in patches and didn't actually even reach its namesake town of Banks. It is now a destination ride (and the weekend crowds demonstrate this). Other reviews pretty much cover it, but it's worth mentioning that this trail is NOT flat (as it has been described in occasional articles) but is evenly graded through most of its center section, making it great for families. The roughly 2% grade climbing steadily over 600' does get your heart pumping, and you need to watch your speed on the downhill during busier times, but it's shady and pleasant on a summer day or crisp and colorful on a fall day. 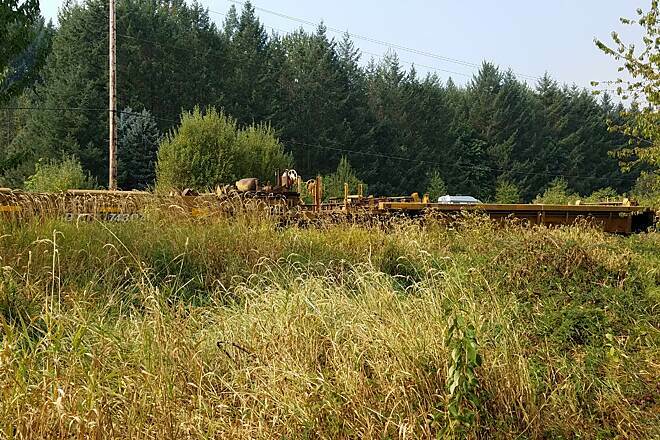 It is now paved end-to-end (and beyond in Vernonia--don't miss the continuation of the trail around the old mill pond), with only a few gravel road crossings. It would be great if the bumpy chip seal section near Manning could be repaved, and there are a few rough patches, but overall, the ride quality is fine for a road bike. Please be courteous and look/yield at all the driveway crossings, especially nearer the Banks trailhead. These are people's farms, and it can be pretty hard [and potentially dangerous] getting out to the main road on a busy Saturday with so many trail users not paying any attention. Stub Stewart State Park in the middle can make a great "camp and ride", but do note that the grades in the park can only be described as "steep" and aren't easy for younger kids and some adults. Great mountain bike trails and disc golf, though! A truly amazing place; always memorable. Living nearby, we've ridden the trail as total newbies and with grandkids, riding only sections; with a few years experience behind us, we have worked up to riding the entire distance out and back. Always a blast! NOTE: Older reviews on the Rails-to-Trails site reference sections of the trail being gravel, which is no longer the case. It's paved end to end. Made the drive down from Tacoma as we had already ridden every stretch of bike path in WA over 5 miles long. Started in Vernonia mid afternoon on a beautiful Sunday with temps in the mid 80s. The first 3 miles are fairly flat and mostly shaded with a few frost heaves and plenty of bugs (likely because of the small stream along the trail here). After that it is up hill for the next 5 miles. A short descent and cross the highway to head back up the other side (shame the trestle isn't trail ready, what a view that would be.) 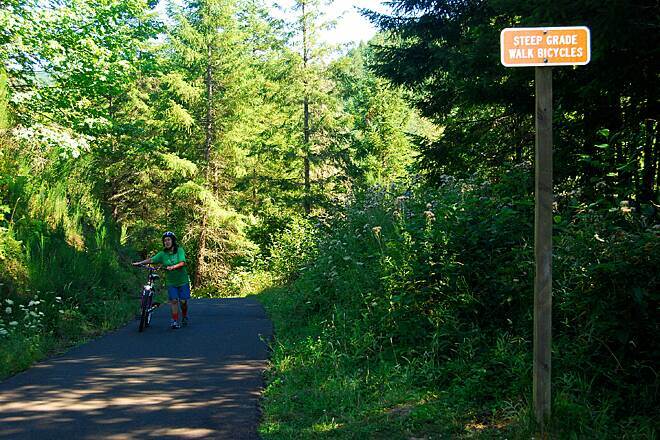 Another 2 miles of climbing brings you to Stub Stewart State Park and its maze of mountain bike trails. We had lunch at the visitors center before turning back to Vernonia. The reward for the first 90 minutes of riding was a downhill ride all the way back to the car. 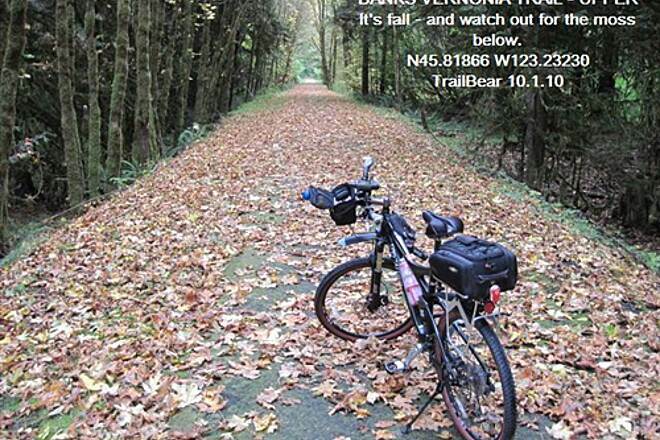 As for the title of this review, with the huge number of defunct rail lines in the PNW both Seattle and Portland could make themselves destination cities for cyclists looking to spend hours riding through the beauty we have here without having to dodge cars and traffic. There is something special about riding without the fear of getting smashed by cars. Rails to trails general bring out this experience and allow the rider to enjoy the ride. The steepest you can bring a locomotive up or down a hill also plays into the enjoyment of a rails to trails conversion and explains why many rail roads or converted abandoned railroads are along slow meandering rivers, the river grade just works. For the first 3 miles the rails to trails is following a live railroad making my favorite hybrid a rails with trails. 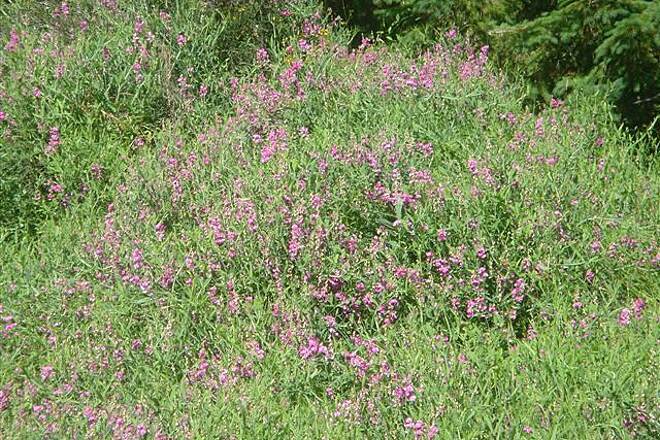 The Banks Vernonia doesn’t travel by a river but does have a definite increase in elevation and then just the opposite. The coasting downhill is so much fun, it makes all the work done to get up the hill almost worth it. We started at Banks, and climbed up to where Horseshoe trestle would have been the highest point in elevation of the trip (Give or Take), however horseshoe trestle is not part of the trail, so with a well done but mighty disappointing permanent detour we switched back and forth dropping elevation and cross the road dodging cars as you see fit then doing switchbacks on the other side gaining elevation. I hate to sound ungrateful, Oregon State Parks has done such a great job with this trail, but a continuation to Astoria Oregon could turn an out and back into a complete adventure. Banks to Clatskanie OR 49 miles with a nice motel stay in Clatskanie and 35 mile ride to Astoria the next day. Oh the adventures that await. Safe travel cannot be taken for granted, and the only safe travel is that on the Banks-Vernonia. Oh the potential for expansions! 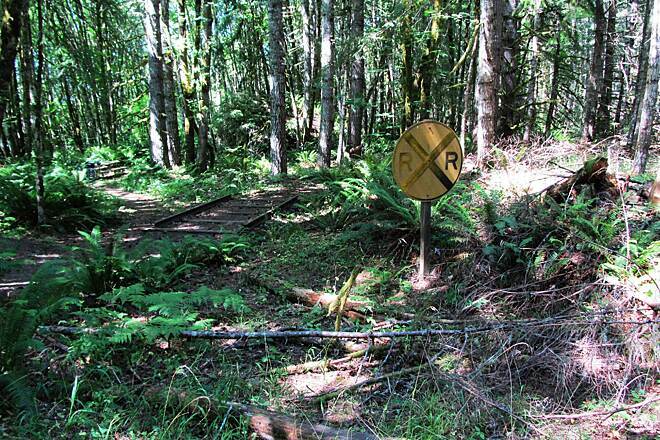 This safe rail to trail is a logging railroad which reached its peak in traffic after the Tillamook Burn of 1933 with a salvage operation moving logs to the mills by rail in a complete BOOM. Sadly Boom is followed by Bust and by 1957 the mill was gone and the line was abandoned in 1973. 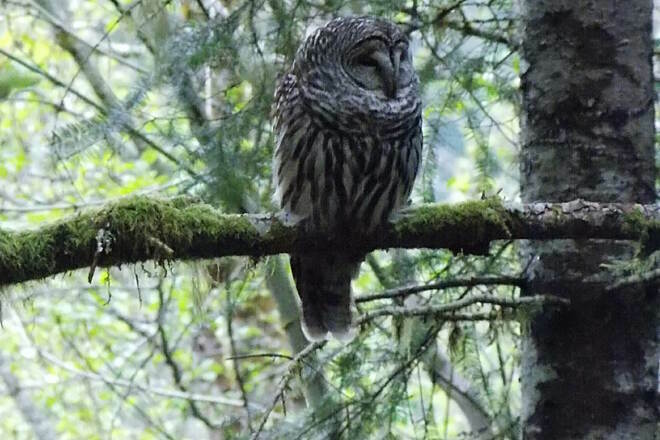 A certain sadness is felt by this visitor to the coast range I ask myself why is it so hard to be sustainable. These questions become more poignant from the seat of a bike traveling between 8 and 14 miles per hour. This trail is such a fantastic example of what is possible in our society. The coastal range provides the most beautiful scenery, Humanity has created a smooth wide asphalt covered safe way to travel without petroleum and for enjoyment. Thank you Oregon State Parks for providing me with a location to have an enjoyable and unforgettable experience with my best friends and family members by marriage (LAW). A picture taken of a beautiful natural scene will be thrown out in the end unless a connected human is in the picture. This trail provided the connection to nature and friendship, thank you to my family and friend for the ride. Take the time to go out and ride this trail, I think you will find it worth your time, and most important share the experience with a loved one, Love is what make this life possible! By the way did I mention it rained HARD (well we are in the Coastal Range) Consider this comment when planning what clothes to wear. OK I will just say it instead of beating around the Bush, bring a rain jacket and rain pants. My in-laws were headed to Northern Romania for a month, so our family decided to brave the Easter weekend traffic and highball it to PDX. With Putin next door to their destination, we figured we better find out where the Will is and where they keep the delicious plum brandy they make. Joking aside I felt this was a perfect weekend to introduce my daughter and wife to my new found passion for rails to trails rides. I called up ecousin and his brother-in-law. At first it seemed impossible. ecousin was working 10 hour nights and 8 hour days, and his brother in law (from here on we will call him Dan), was recovering from surgery. I was still determined to go riding so I bought a couple of bicycle racks for my wife's car and we headed north. I was surprised to find out that two bicycles on the roof only cut our mileage by 1/2mpg. I guess that is one advantage of driving a German tank. Evidently the temptation of Rails to Trails trumps the desire for money, and ecousin quit his night job to join us. Dan skipped his sons baseball game, and we officially got the band back together (see JWPT post). Driving out of Portland with a few sprinkles and that Oregon April sky made me a bit nervous. April in Cascadia is one thing, but the Coast range north of the Metro area can resemble waterboarding, and living in the desert, I tend to shy away from drenching liquids (I prefer them fermented). The Banks trail head was easy to find, free to park, and had everything one could possibly need including a bicycle shop. We didn't need the shop that day, but good to know it was there. Within minutes we were rolling north at about 8mph through cloudy blue light and apple blossoms. In light intermittent rain we almost couldn't perceive the grade. Climbing in humidity I soon came to realize my effort (knobby tires), and shed my track pants. Standard Coast Range creeks and their oxbow personality dominate the first seven miles of the 21 up to Vernonia. Around mile seven we reached the Buxton Trestle. We stopped for pictures, and worked with several other cyclists to add to our stash of pictures we will never look at again. From this point it started to rain. We continued to climb the gentle grade. It is about as pleasant as a workout can be. Soft and warm April rain with the cadence of continuous climbing. We noticed the weird place names in the L.L. Stewart State Park. I won't recount them...ride the trail yourself and you will chuckle your way between mile 7 and mile 11. 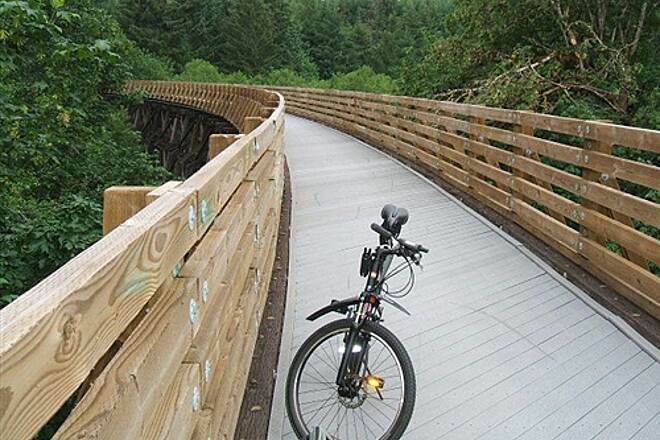 Exiting the state park section is almost terrifying, and signs abound instructing cyclists to dismount and walk the 11% grade down and up the crossing of Nahalem Highway. We chose to ride cautiously because trail use was very light on that drizzling April morning. As I looked up at the unused Horseshoe Trestle to the north of the crossing my wife texted that she was on her way with our 9 year old daughter. 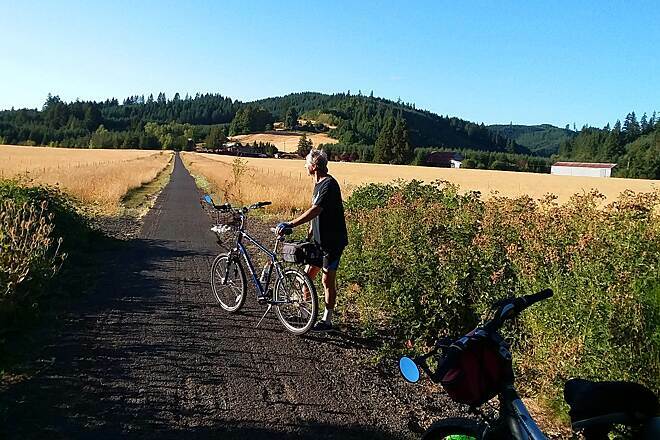 They were due to meet us in Vernonia for lunch, and hoping to ride the trail back to Banks. She asked if it was raining. I told her "just a bit". Then it really started to rain. When we reached a repulsive clearcut at the top of the grade and clearly outside the state park, the rain became so hard that we had to take a shelter break under the boughs of Oregon forest. It is amazing how little rain reaches the ground in an intact forest, and how rain destroys the land when you cut down all the trees. A bit hungry, and feeling a sun break with blossoms of apples and pears in our view we powered fast to Vernonia. My wife and kid were already there and shopping at a thrift store where they found themselves some track pants for their leg of the ride. We rolled in at high noon. We left Banks at 9:15. 2 hrs 45 minutes. Not bad for three geezers in the rain taking breaks to eat, and two of us on mountain bikes. We ate at Black Bear Cafe. Good eats, and nice folks too. The bathroom was extra cool. After food my wife and kid started south, and ecousin, Dan and I set out to explore the town a bit. We found a logging locomotive with gear driven wheels, and lots of houses that have new foundations that make the crawlspaces almost a basement. Numerous floods have driven the designs. This part of the Coast Range sees its share of Pacific moisture. Rolling south now we soon caught up with my wife and offspring. Light rain wasn't dampening anyone's spirit, and we took turns surging and falling back as cyclists commonly do. From Vernonia you "kind of" climb for a while. At least this is what I told our new troop members. It isn't near the elevation change that occurs between mile 3 and 11 coming "up" from Banks, but for a 9 year old that first 10 miles going south from Vernonia must seem a bit tiring. It didn't help that in spite of bright sunshine during our lunch break, we now had drenching rain. Drenching. Ecousin, Dan and my wife kept the little one focused and happy. They are all better parents than me. I was focused on that bomber downhill at the halfway point. I wouldn't be disappointed. We made it back through the steep drop to Highway 47. I was terrified to have my kid really rely on brakes. She did fine. She even rode up half the other side before we all decided to walk up the remainder of the hill. We were instructed to do so by the signs anyway. 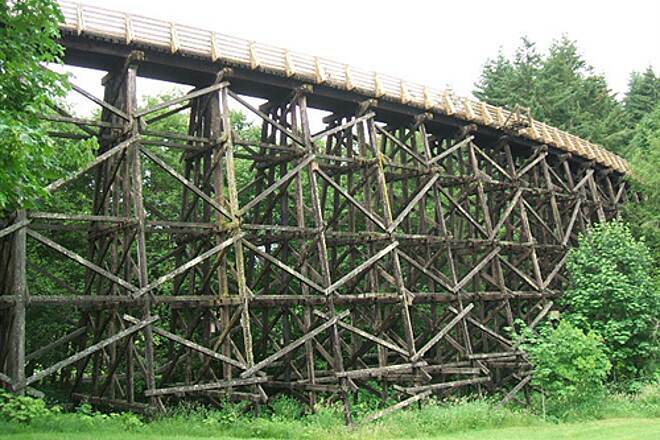 Once up on top again we made a pact to restore Horseshoe Trestle when we win Powerball. Gliding the ridge I dodged some beautiful snails with blue shells that my daughter promptly saved by relocating them far off the trail. Hard rain on and off, and 3 of 5 of us not wearing rain gear. I am not sure why I couldn't get my point across about the importance of rain gear to our new riders, but I don't want to go back to that cold place either. I packed it in the car, yet I couldn't convince them to wear it. Perhaps on future rides my words will be heard. Anyhow. We get to blessed MP 11. From there it is the most glorious 8 miles of paved pleasure. Averaging 18 mph and with perfect cold wind I stopped only on the trestle. I waited for my family and friends to catch up. They were cold, except Dan. He had rain gear. We were lucky to find brilliant sunshine and dry out a few jackets. We took a few more pictures, I gave my rain coat to my daughter and pedaled hard to Banks. At the trail-head I waited. Then, I waited more. Eventually everyone trickled in, and we did the shuttle. Dan and I went to get some tea. Soon ecousin, my wife and daughter were all back, all the bikes were stowed, Highway 26 traffic navigated, and we were back at the in laws getting barked at for having a healthy hobby. When the in laws return from Europe I will try to get them to ride bicycles with me. I know they will resist, but all it takes to hook a person is one fun downhill stretch like Mile 11 to mile 3 of Banks-Vernonia. The climb you made is it's own reward. Where else can you run 20 miles without traffic in the Portland metro area? 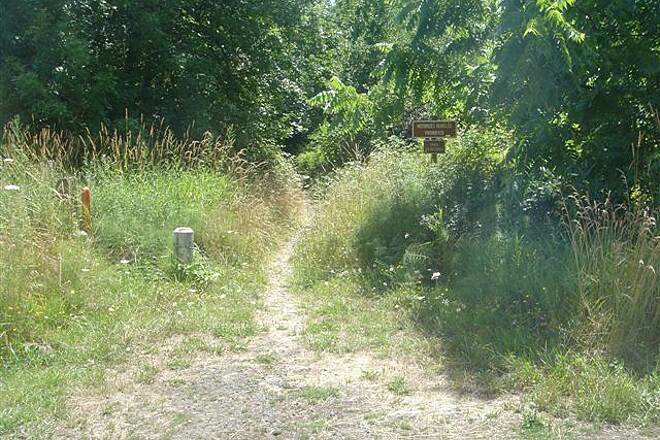 This trail is safe, paved, well-maintained, has clean restrooms at the Banks trailhead and it is marked every half mile. It's a 45 minute drive from my house but totally worth the trip. The only complaint I have is that leash laws are not enforced. We are from California, and we have done this trail two years in a row. We have done it in the summer when the temperatures are in the 90's because it is entirely shaded with a canopy of trees for most of the route. We have ridden this with specialized hybrids. The trail is asphalt, and in good condition. There are plenty of bathrooms, and picnic areas. We start in Banks where there is a dedicated route parking area with bathrooms. It is a slow gradual ascent to Vernonia. Be sure to pack a lunch, and plenty of fluids. About midway there is a very steep drop and incline which we believe was once a trestle site. Best to dismount, and hoof it for safety. 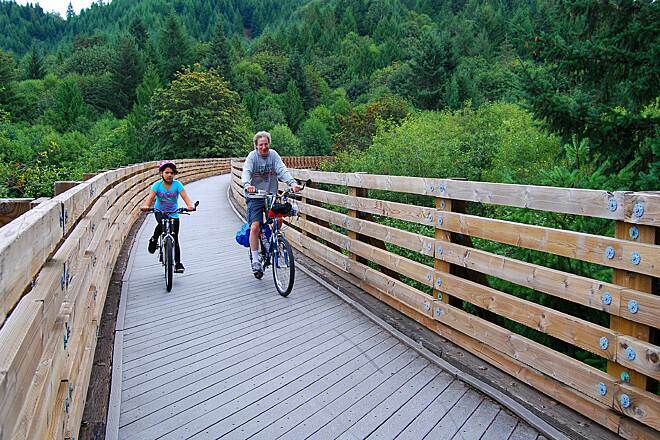 There is a park and campground which you enter at the end of the ride in Vernonia. They want you to pay to use the park, but we just took a 20 minute break to rest and eat, and no one hassled us. In the summer there are wild cherries, and berries. We spotted a large owl flying over our heads, It is so beautiful and peaceful. It is our favorite ride right below The Trail of the Hiawathas. This trail will not disappoint. The best part of the ride...it is a coast downhill all the way back!! Can we ask Oregon State parks to yurt this trail? We rode from Vernonia to Banks and back in the same day. It made for a long ride, but allowed us to see the entire trail in one day. I would not recommend a total trail ride unless you are a good intermediate rider. 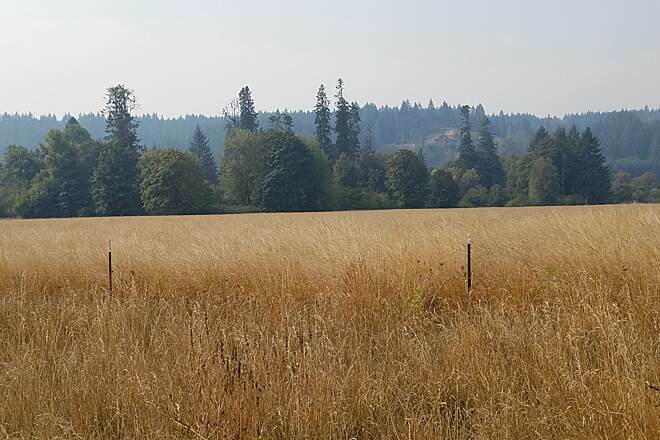 We ride the Chehalis Western Trail in Olympia and the Coeur d'Alene trail at least once a year, so we use those as a reference. We found the trail in need of some repaving. The tar used to cover the cracks in Vernonia was very slippery on the 80 degree day we visited. It is a steady climb up to where you drop down to the Nehalem Highway. The switchbacks are very steep and the corners very tight. We walked after the first corner. It is downhill into Banks where we found the only place to eat was a small sandwich shop. Some parts of the trail were chipseal and we encountered loose gravel at some road crossings. The forest was beautiful and much cooler than the open sunny areas. After riding the trail we all agreed that we were glad we had done it, but there wasn't enough there to bring us back again. Pretty nice road surface and nice grade all the way through, a little uneven the last 6 miles towards Banks, but nothing to complain about for a trail so close to Portland. Avoid weekends if possible which can bring heavy bike and foot traffic. If going on a weekend, start early in the morning. We started at 10AM on a Saturday in May and it was already crowded at places. 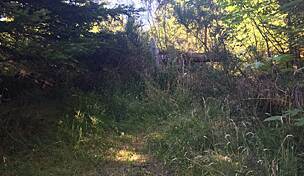 There is a steep downhill section halfway to Vernonia, a few miles past the road/parking lot to Stub Stewart State Park, with a few switchbacks where you need to exercise care as it comes up quickly without notice. If you're not familiar with this section, go slow and be ready to brake hard. Recommend starting in Banks as there is a nice downhill on the way back. Overall ... great bike trail. Took work off on a Tuesday with 2 other riding buddies. Partly cloudy skies and a bit on the cool side - perfect conditions. 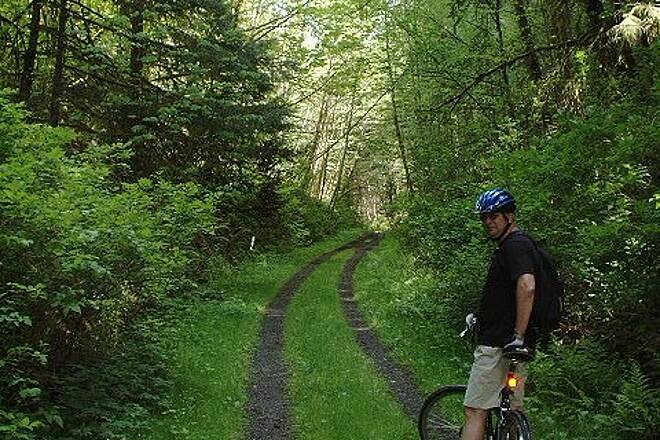 I was really impressed with the whole trail from Banks to Vernonia - a great riding experience. The condition of the trail, and the facilities are very good. Starting from Banks you have about 6 miles on flat trail to warm up before the steady, even climb up to about mile 11.5 (railroad grade, obviously), and then it's down into Vernonia. The up/down switchback section while steep is not long, and quickly overcome. There is one small slightly collapsed section (closer to Banks), a bit of a surprise at speed. Also, a couple of the bridges have abrupt edges, but nothing too serious. There were a few others out on their bikes, but most of the ride was just the 3 of us. Ran into several mountain bikers on the Vernonia side, probably headed for the Stub-Stewart trails. An excellent round-trip jaunt. Highly recommended! 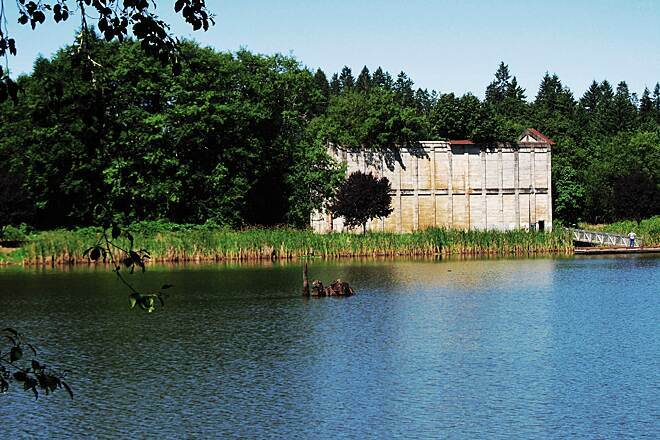 We also got a good laugh when we thought we were riding around the Vernonia Lake, which was really the sewage treatment plant - hilarious! TRAILBEAR Grabs Air - descent from Buxton. The Banks Trailhead was rather full - and why not. A great trail just an hour from Portland and a park with camping in the middle. What is not to like? Well, the weather, for one. 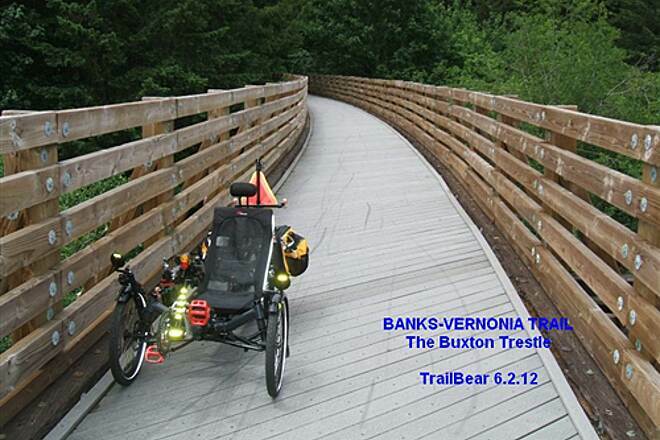 Buxton was busy, but it was not raining after lunch, so out comes the trike and TrailBear is off across the trestle and down the grade. There is a lovely stretch of downhill from the trestle with woods on both sides. The effect is a green tunnel and Shackleton (trike) headed down it, cracking on speed to 23.3 mph in high cog x high ring x overdrive (with slows to pass). Last time I was doing 18 mph on the mountain bike on that bit. Trike smoke 'em down hill. Uphill, everyone smokes the trike. It was a rush. The only excitement was a bridge approach graded way too steep. Shack hit that at full , went airborne and landed on the far side and kept moving (Bear grabs air). Love the full suspension. Soon enough we were out of the woods and the grade flattened out. Speed dropped to 12 mph. Enjoy it while you can. You will be grinding up the same grade in an hour. And so it was. TB likes to do his climbing early in the ride and save the downhill rush for going home. But not when you start at Buxton and head to Banks. Hit the Banks trailhead, turn around, and start pedaling back uphill. Speeds were 4-9 mph. Not nearly as much fun. Beautiful trail, views, wildlife and such. Nice mix of sun and shade. But, the trail never stops climbing until you go down to Vernonia last little bit, then a long climb back up. Sure, you coast all the way back but the trip up is grueling for those of us who are casual riders. Long climb in the lowest gears. 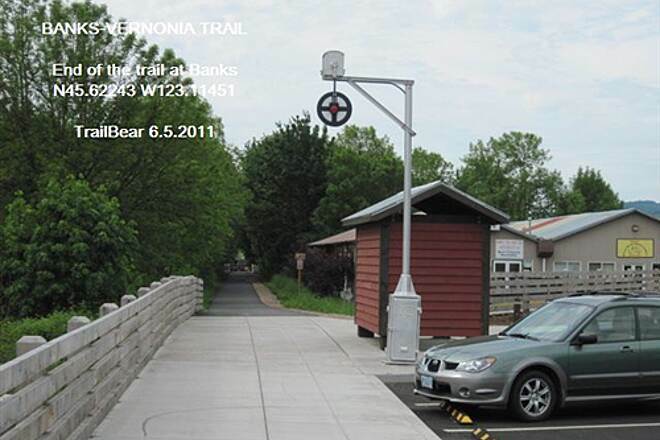 The Banks-Vernonia, one of TrailBear’s favorite Oregon rail trails, has gotten even better with the completion of several upgrade projects in 2010. 5*	Scenery. It’s a well shaded forest ride: Farms, fields, one historic wooden trestle to ride and one to look at – the ruins at Tophill. 5*	Trailbed. This is a fast blacktop trail. A few root heaves but miles of smooth riding. 4*	Facilities. 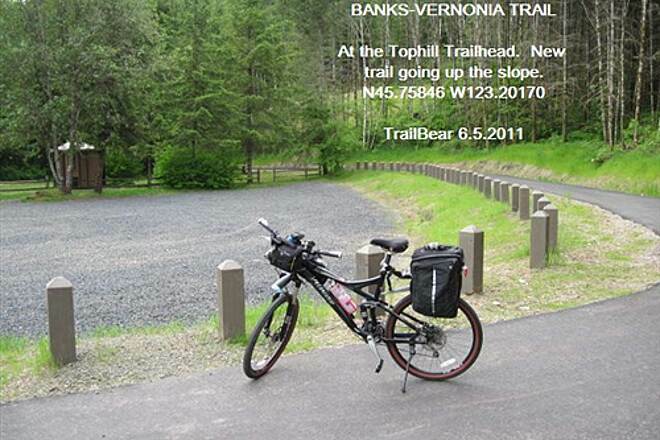 Trailheads at Banks, Manning, Buxton, Tophill, Beaver Creek and Vernonia. 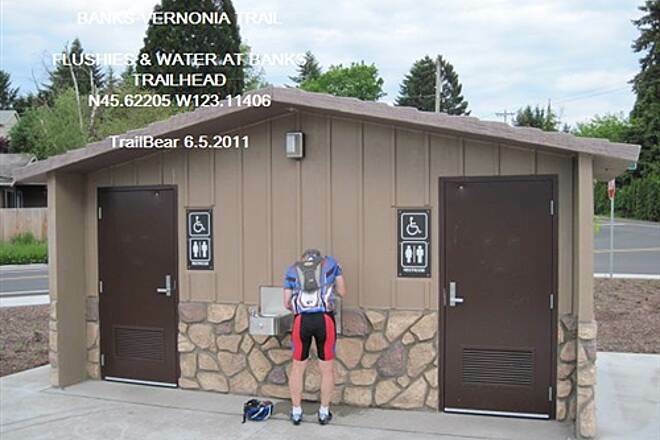 Banks and Vernonia have restrooms and water. The others have vault toilets. A short climb from the trail crossing in Stub Stewart takes you to the Visitor Center – flushies, water, information, parking and wifi. 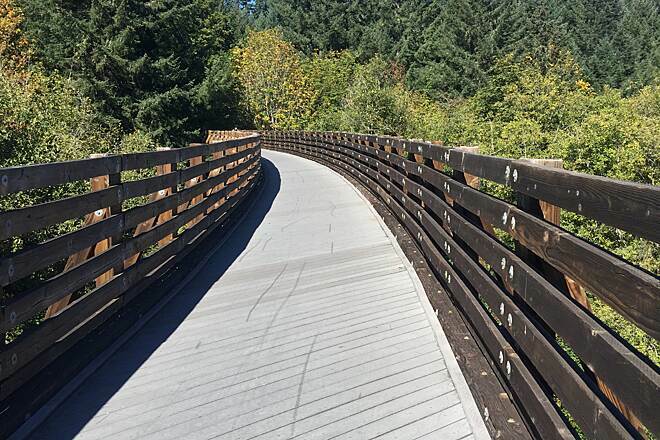 The Banks Vernonia Trail is now finished. It now runs from Banks to Vernonia and is paved all the way. The new trailhead at Banks has blacktop parking, two unisex flush toilets, a water fountain and information kiosk. There is overflow parking across the street. Good highway signage guides you through Banks to the trailhead. Expect this trailhead to be packed on good summer weekends. It would be a good place to sell ice cream. The trail on both sides of the valley at Tophill Trailhead is new and relocated. The remains of the burned trestle still stand, but the trail up from Stub Stewart State Park diverts into a new set of switchbacks down the slope. There are some 10% grades here with sharp turns. The sign tells you to walk the bike. Sure, uphill. Downhill, well … perhaps a bit of coasting. Best you be coasting really slow at each hairpin turn. They are not banked for 30 mph. Once down and across the road, you get to climb up the next set of switchbacks. Walk the bike. TrailBear did. The old cut, last seen in 2010 as a muddy quagmire, has been abandoned and bermed closed. The trail hangs on the outer slope of that hill. From there the gravel track is now fresh blacktop. Enjoy. A new map and brochure has been printed. 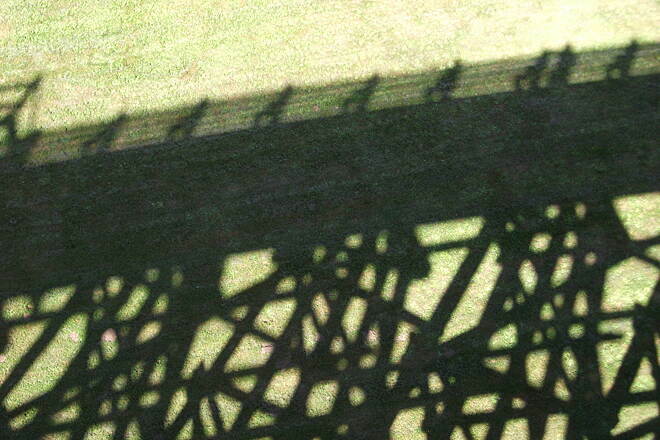 If yours has riders at the Buxton Trestle on the cover, it is the old version. The new one shows a new trailhead parking area located where the trail makes the last right turn on the edge of town and squares away for Anderson Park. As of June 2011, that facility is not there. It is waste ground. This is probably a “Stay Tuned” item. Dedicated trail end parking will be a nice addition to the trail. As before, there are restrooms, water and a fine picnic shelter at the park. 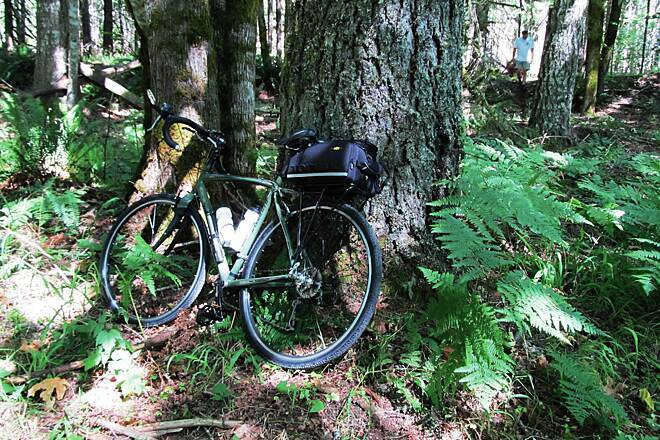 If staging out of Vernonia, TB will often park at the library, about a block off the trail. He prefers to stage at the bottom of the ride, climb in the cool of the morning, then bomb back downhill in the afternoon. 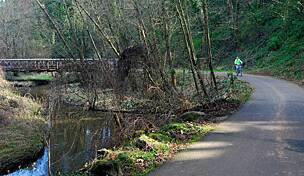 The Banks-Vernonia Trail will actually run from Banks to Vernonia at last. You should be able to ride on blacktop from Banks up to Vernonia. The Tophill section is being paved and realigned around the quagmire cutting by the Tophill trestle, so it should be an even better ride. The opening ceremony is on Friday, Oct. 29, 2010 at 11 PM in Banks. The trail will open at 11:30. Be there and score some refreshments along the line. 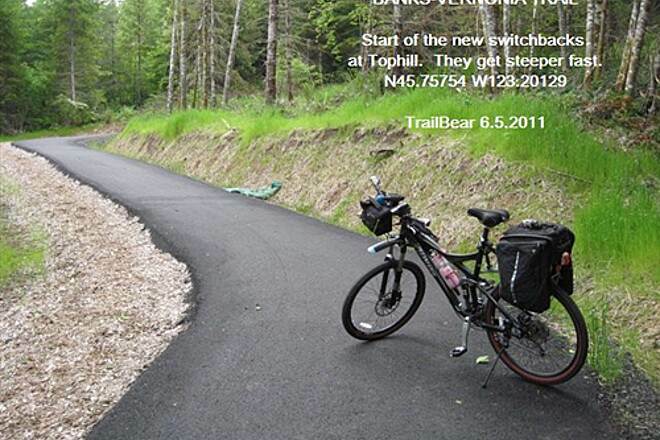 There is a new trailhead down in Banks at 45.622173° -123.114092° (Newhalem Hwy x NW Banks Rd.). The TrailBear was looking forward to getting out of the rainy San Juans and doing the Banks-Vernonia. (He was rained off it in June - both ends of summer were wet.) Checking for current data, he came across this notice, both in the state web site and in the local paper. 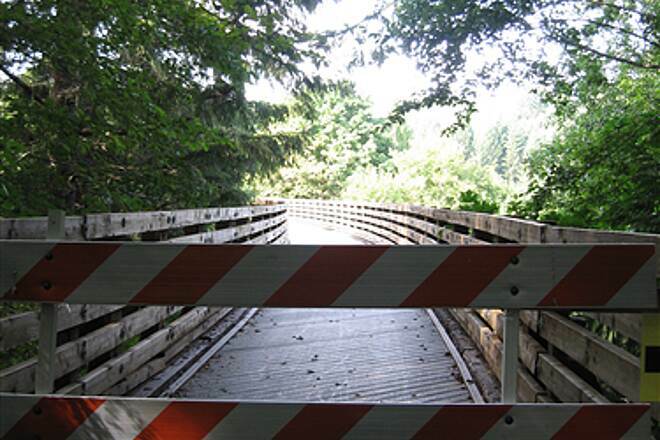 A segment of the Banks-Vernonia State Trail between the Tophill and Beaver Creek trailheads will be closed for trail construction beginning Sept. 20. The trail will be closed from McDonald Road just over one mile south of the Beaver Creek Trailhead to the bridge over Highway 47 near Tophill until at least Oct. 15. The bridge is about one mile north of the entrance to Stub Stewart State Park. 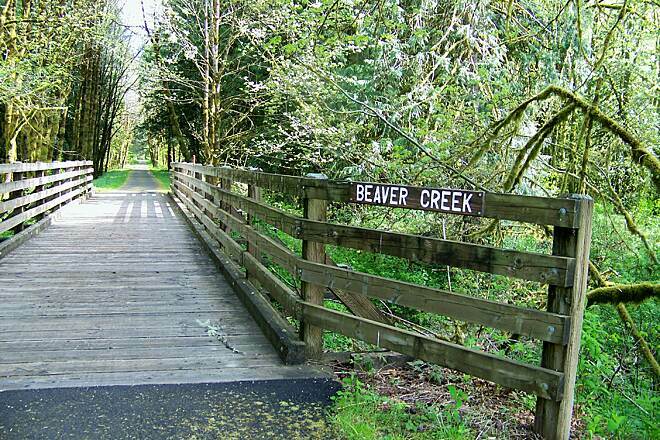 The Beaver Creek Trailhead, which is just over four miles south of Vernonia, will be open only on weekends until Oct. 1 while workers there repair a bridge crossing the creek to the site from Highway 47. 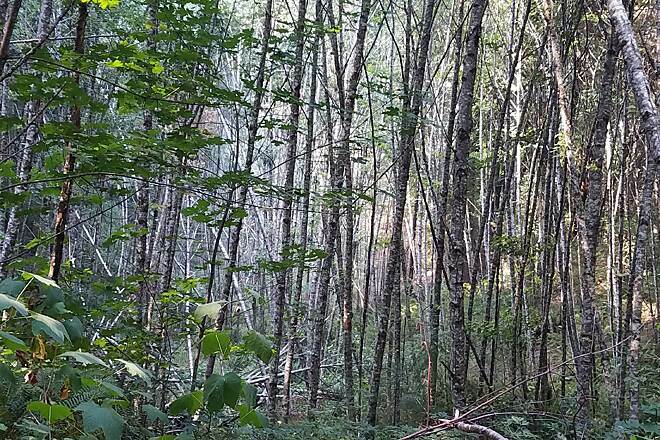 The trail closure will remain in effect while an Oregon Parks and Recreation Department contractor paves a three-mile stretch of unpaved trail. 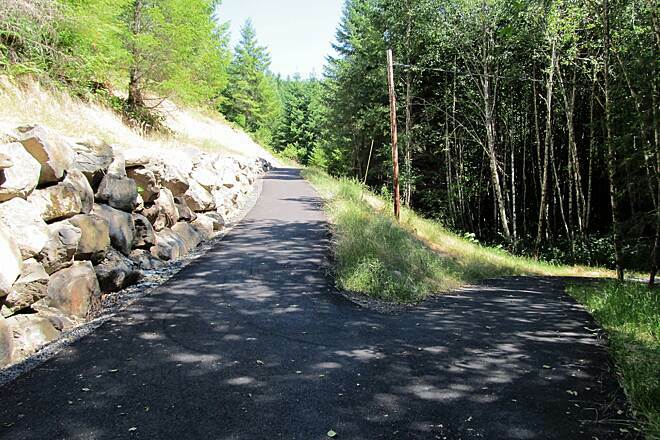 The entire 21-mile trail will have a paved surface once the paving project, a trail realignment near Tophill and work on a new Banks Trailhead are completed. 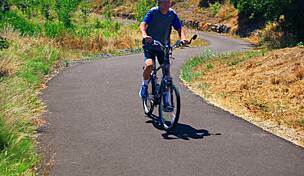 A federally funded $100,000 Recreation Trails Program grant and Oregon State Lottery dollars are paying for the $500,000 paving and realignment projects, officials said. 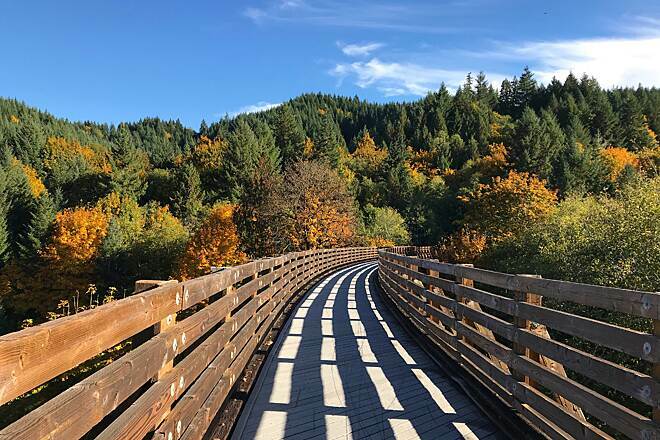 Updated information on the reopening of the trail segment will be available through the OPRD website (www.oregonstateparks.org) and the state parks information center, 1-800-551-6949. " @@@ ARE THEY FIXING THE TOPHILL GAP? 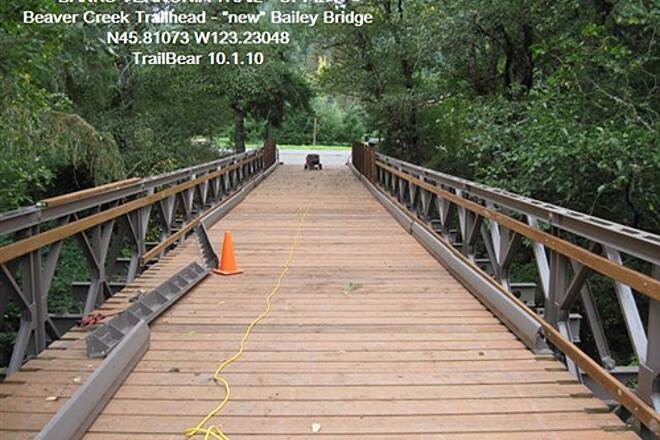 TrailBear was poking around the Tophill section in June 2010 The trail is paved from Stub Steward up the line to the bridge at 45.745861 -123.196621. From there up the line past the Tophill TH, it is gravel road. Not a bad surface from the Tophill TH down to the bridge. Only two sections of small mire. On the other side of the highway there is a cutting where they have let the ditches go and it was about 50 yds of utter mire contained between the wall of the cutting. For shame! The RR had ballast and ditches there. Where did they go? No way to tippy toe thru the slop and TB was not about to go mountain biking thru the mire when he has to sleep with the bike in the van. Worse than snuggling up to a wet Lab. The upper end of the closure is vicinity McDonald Rd. at 45.792261 -123.220615. Looks like about four miles closed vicinity Tophill. The ride out of Stub Steward down to Manning - or even Banks if they have finished that section of extension and the new trail head - is a delight. 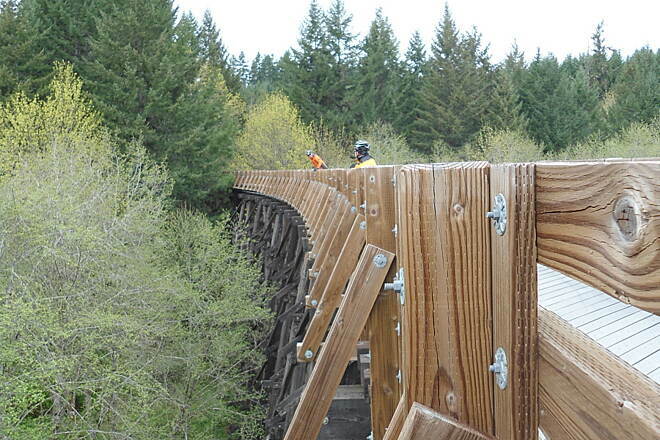 BANKS VERNONIA LINEAR STATE PARK – Buxton trestle open to riders. It’s a nice place to spend a weekend riding on a good blacktop trail bed. The BVT starts at Anderson Park in Vernonia. (Camping, hookups, showers, covered picnic shelter). Runs down to dead end (no trail head here) outside of Banks. Distance is 21 miles. The trail is 8’ of nice blacktop most of the way. The exception is the Tophill diversion around the trestle there. The terrain runs from forested hills (shade) to farmland in the valley bottoms. Coming down the hills from Vernonia toward Portland, there are trail heads with parking at Anderson Park, Beaver Creek, Tophill, Stub Stewart State Park, Buxton and Manning. See the trailhead notes for the GPS coordinates and facilities notes. Water can be found at Anderson and Stub Stewart. I see that TrailLink <http://www.traillink.com/> has the route, but none of the tail head details and shows a Banks-Vernonia State Park that does not exist. 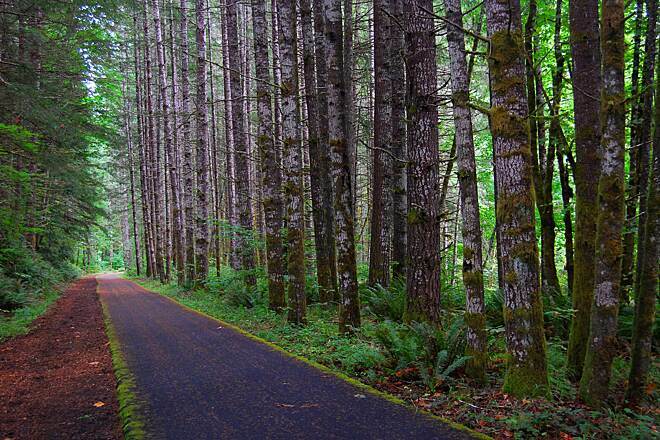 The Banks-Vernonia State Linear Park (rail trail) does. On the other hand, they don’t show the Stub Stewart State Park, which does exist. “L.L.” Stub Stewart State Park is about midway and very modern (2007) with two RV campgrounds, a tent campground, horse campground, cabins, etc. Stop at the Visitor Center there for trail maps and facilities. The BVT is paved down to the vicinity of Tophill Trestle. From there you take a gravel diversion down into the valley, across OR 47, and back up the other side of the valley to rejoin the rail bed. Blacktop picks up beyond there and continues down to the end of the trail. I took the section from the SSSP trail crossing down to the Manning Trail Head as a Down & Up. It was a delicious downhill ride on excellent blacktop. You are in the forest until you exit the park, so you ride down a green tunnel and the air is cool. Then out of the park, across the fields to Manning. I left the SSSP trail crossing (Elevation 875’) at 0938 and was at Manning (Elevation 257’) at 1010. Milage: 6.16. Max speed 21.5 mph and moving average 14.3 with little effort (just wait until the return – 13.5 max and 7.6 average). Picnic tables and benches are located along the route, usually where there is a view. 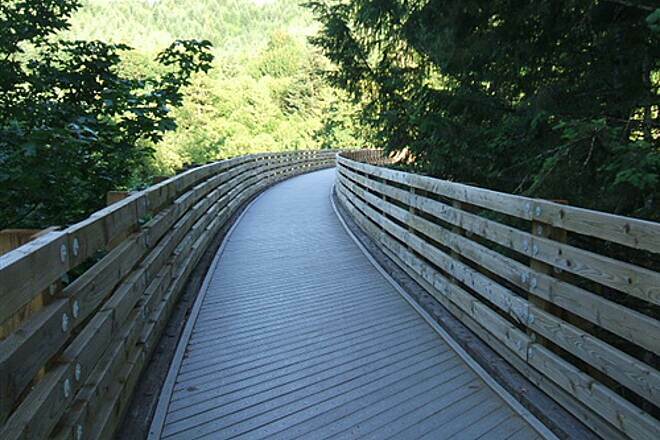 The best bit is the refurbished curved trestle at Buxton Trailhead. They have decked it with Trex boards, laid diagonally, and railed it with 3x material to breast height. On the way back, take the horse bypass down below and get some photos of the trestle from the bottom. There are so few of these left. The time had been when they were all over the west. 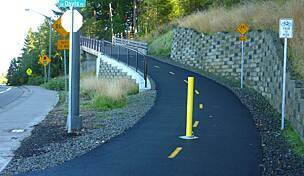 The Vernonia Voice reports that the state has the funding to complete the backtop on the Tophill section of the trail. The trestle there will be removed. 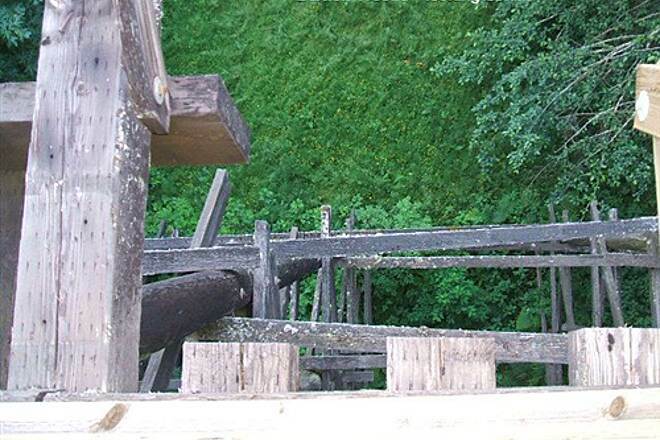 (Check the TL picture file - the poor trestle is only part there.) The trail will be extended into Banks where a trail head will be constructed. Expect completion in 2010 or 2011. The park folks say that the mountain bike single track project in the park is in the plan – but has not happened yet. Stay tuned for this one. MANNING Trailhead (N45d 39.892’ x W123d 09.809’) - small gravel parking lot, 2 picnic tables, NO toilet or water. Closest to Portland and bottom end of trail, so it gets used. BUXTON Trailhead (N45d 41.905’ x W123d 11.009’) - large gravel parking lot, vault toilet, covered picnic shelter, numerous scattered picnic tables. Horse facilities. No water seen. The Buxton Trestle is at the bottom of the trailhead. Best feature on the trail. 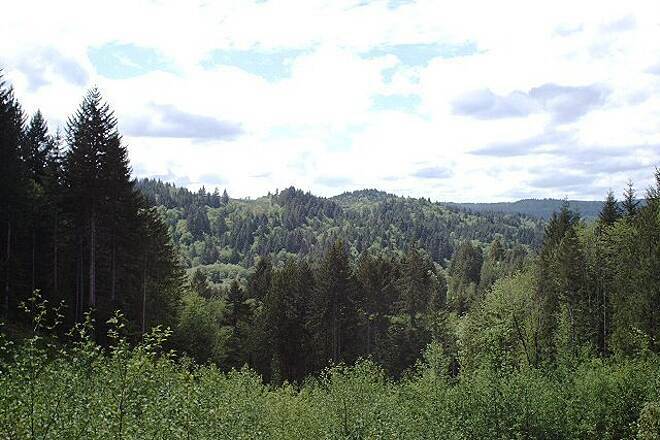 STUB STEWART STATE PARK Trail Crossing (N45d 44.257’ x W123d 11.721) - limited time parking & limited spaces. I staged out of the Visitor Center up the road for toilets, water, phone, wifi hotspot, parking, etc.). SSSP is new and has several excellent campgrounds from full hookup to tent sites. TOPHILL Trailhead (N45d 45.501’ x W123d 12.091’) - gravel parking lot, vault toilet, picnic table, horse facilities, no water. There is a gravel diversion around the Tophill Trestle (crosses over OR 47). This is the only gravel on the trail. BEAVER CREEK Trailhead (N45d 48.641’ x W123d 13.863’) - large gravel parking lot along highway and trail heading over bridge to the BV Trail. Picnic tables along the trail. The vault toilet is hidden about 100 yds down (toward TopHill) the trail. No water. 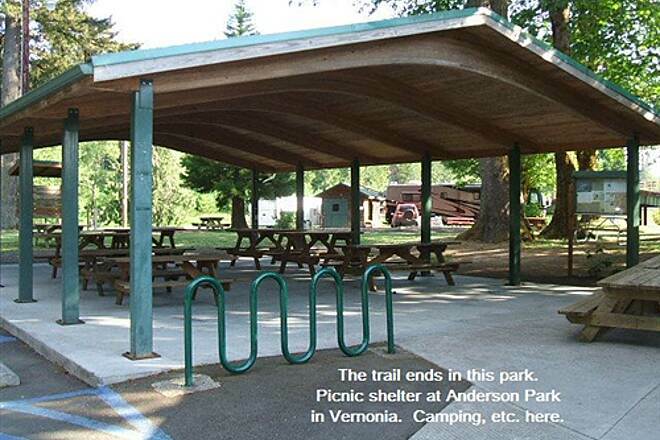 ANDERSON PARK (VERNONIA) Trailhead & End (N45d 51.374’ x W123d 11.686’) - The park has camping (hookups), flush toilets, showers, water, and a large covered picnic shelter, etc. Nice place to stage out of if you can arrange a shuttle and do the trail downhill. Apparently this is the summer that major changes are happening on the trail. 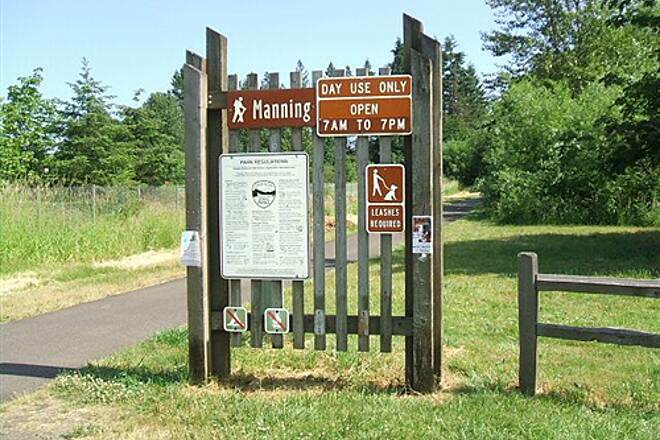 We started at the Manning Trailhead on Pihl Road, just off Highway 47. The parking lot was filled with construction equipment and gravel piles. Another trail user told us to go a hundred yards east to Pongratz Road and continue north on the gravel road until we met the trail again. It was about a 1 1/2 mile detour, but when we got there, we could see the trail was under construction and will probably be complete in a couple of weeks. I just viewed the area on Google's satellite view and saw that when the picture was taken, at least part of this section was a cultivated field. It should be completed shortly. We continued on up the trail, now a beautiful newly paved path with a woodchip border for equestrian traffic. It was a steady uphill climb for the next seven miles. 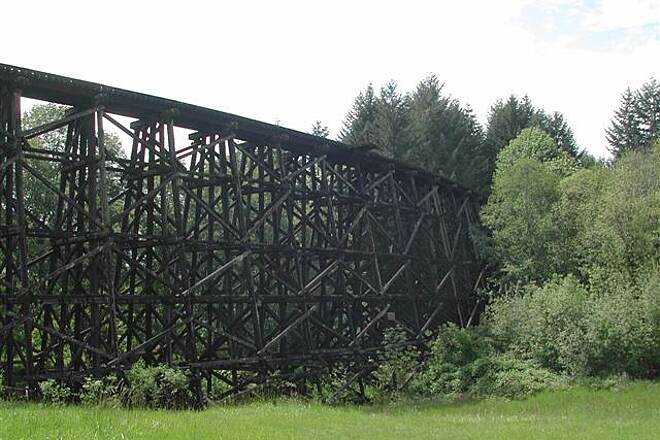 The only exception was the horseshoe trestle just south of the state park picnic area. It too is under construction and looks like it will open any day now. In the meantime, you take a good but steep path down and up the other side of the valley to the picnic area. We continued on several more miles to another crossroad in the state park. Beyond the road was a steep grade and a ballast trail, so we decide to turn around at this point and enjoyed a zippy ride down to our starting point. A 2 or 3% grade kept us at 15 mph without pedaling, all the way to the detour. Even though it was a hot day in August, trail users are under a tree canopy for most of the ride. It is a thoroughly enjoyable trail. We rode our tandem from "Stub" Stewart State Park (listed in our GPS as "Hares Canyon State Park" a GPS glitch) almost to Banks. The trail ends 1/2 mile before Banks, but turns into single track that crosses a rickety railroad tressel 1/4 mile later. We turned back. At "trail end" there is a short gravel road to Highway 47 to Banks. This highway has no shoulders and logging trucks travel both ways along with moderate heavy traffic. We chickened out. There are occasional 2" thick gravel crossings on this end of the trail, however the 1 mile gravel stretch of the trail was not a problem. We returned to Manning for lunch, then back uphill 5 miles to the campground. If you're only riding 20 miles we recommend driving to the bottom of the hill and riding up to State Park. You can almost coast your way back. Whichever way you go, this is one of the nicest trails we have ridden. We ride 50 trails a year and plan to come back to this one. Pretty ride with a brand new state park at the middile point. "Great trail, can be enjoyed in many ways. Long, short or whatever your desired distance you won't be disappointed. Easy access from several points. Kids like it too as there are many novice and intermediate stretches. 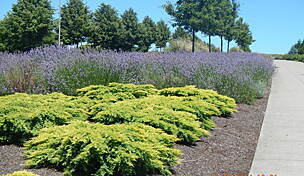 Spend some time here and you'll know why they call Oregon ""The Pacific Wonderland.""" "This is a wonderful trail with two different personalities. Tophill (at the broken trestle) lies right in the middle of this 20 mile trail and allows for coasting in either direction. 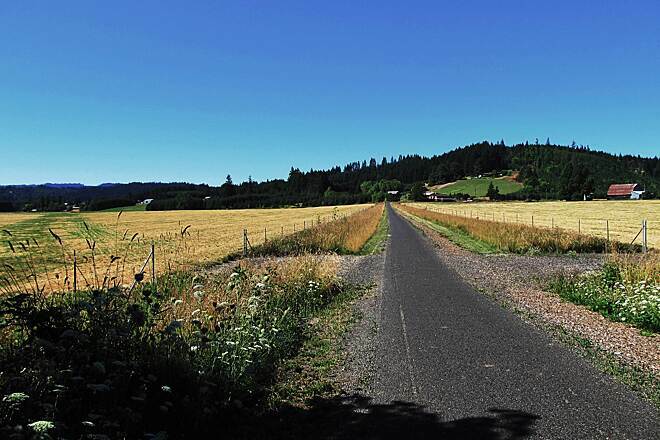 The trail north from Tophill to Vernonia is paved asphalt, with some valley views but quickly lowers to the grade of the highway, which you parallel into Vernonia. 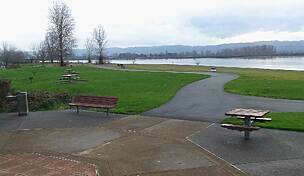 A pleasant community park awaits your arrival for a rest stop or meal. I found the gravel portion of the trail south from Tophill to Manning to be much more scenic, with mountain views, trails through wooded canopies and high ridge line trail. You will get off the trail just short of Manning on a heavy graveled county road with about a half mile ride to the parking area. 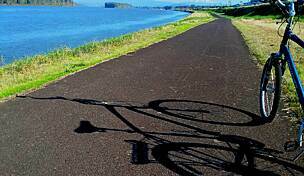 The 2.25 mile paved trail to Banks follows the highway and is a flat easy ride to the end and back. I highly recommend this trail if you can do the shuttle to Tophill. 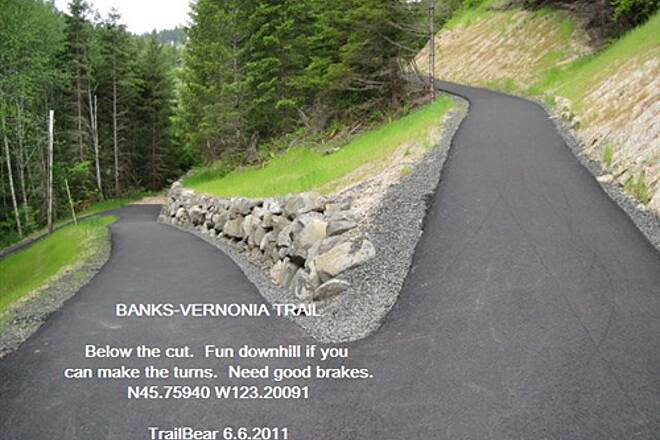 "The Banks-Vernonia Trail is a mild ride that can be either a 20 mile up-and-back or a simple end-to-end run. If you start in Vernonia, you will get about 9.5 miles of gradual uphill and then 10+ miles downhill. The only bad spot is the trestle at the top. You will have to drop down to the road and back up for about 1/2 mile. No big deal!"